Each weekday Aleya tunes into the energetic weather that is coming onto the planet and shares with you a 7-minute audio meditation that helps you shift, balance and harmonize your energetic fields in preparation for your day. 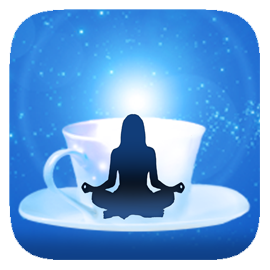 Aleya's Daily Cups of Consciousness are simple yet profound audio meditations using energetic protocols, sound healing, and music to help you live a more balanced and fulfilling life. You are invited to sign up for a FREE Trial Week of the daily Cups in the right-hand column. At the end of your trial week you can choose to subscribe for as little as $12 a month. Receive guidance, energetic alignments, and pearls of wisdom that assist you in your growth and evolution from a place of grace. Many people have told me that I should charge more but I desire to make these tools available to everyone so that money will never be the reason to hold anyone back from the changes they want to see in their life. These TOOLS are priceless pearls. I have purposely made them affordable and I hope they serve you. Get out of a rut! Trust the light that flows within you; hold clarity and calm. I was driving home from a weekend adventure when out of the blue I heard the words "daily meditations". I pondered this and explored the option of recording little meditations with energetic protocols and sound healing to help people out of crisis and into peace. In 2009 I began recording these 7-minute meditations to help my clients stay balanced during the energetic shifts that occur on a regular basis. After a year of sharing these meditations with the people I knew, I realized that others might resonate with these tools as well. 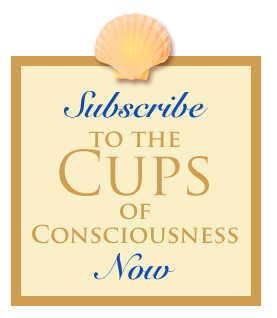 They quickly became known as the "Cups of Consciousness" because, just like a cup of coffee helps you wake up in the morning, these meditations give you a gradual daily awakening to higher levels of consciousness! Click Here to learn more about Aleya's definitions & terms. The effects of these meditations take place in your energetic fields which are typically not in your conscious awareness. As your energy fields shift, you become more sensitive to what is occurring in them. By working with your inner world, you can work with the multitude of energies that create your outer world. As these high vibration meditations become part of your daily routine, your subconscious patterns start to surface and shift. As your energy fields activate and increase their own intelligence, you evolve into higher states of consciousness. This is empowering and has an unlimited capacity to assist you in your own personal growth and evolution. Each mediation gets delivered to your email box each weekday morning. These meditations work very well for people who are energetically and emotionally sensitive to others. People who are living from their heart feel these meditations at a very deep level. If you are in your head a lot it may take time for you to feel these meditations. The more you listen to them, the more you will feel them. It may take two to three months of listening before you feel the radical shift in your life from the head to the heart. Listen to one meditation a week, one every day, or just one a month and see your life gracefully shift. These meditations and activations are both "timely" and "timeless" in their healing topics. Through your subscription, you will progressively build a library of meditations to access any time for your additional specific support needs. Be part of an ever-expanding group that is choosing to grow and evolve from a place of empowerment, abundance, and joy. If you would like to continue receiving your Cup Of Consciousness meditations at the end of your FREE Trial week, come back to the site and purchase a subscription below. I will also send you a reminder at the end of your free week. Get the Cups every weekday, or just 3 days per week (Monday, Wednesday, and Friday) for $12 a month. View Aleya's individual Cups of Consciousness meditations - topic-specific meditations to help you shift any area for as little as $1.50/ea. The TALL Cups of Consciousness are 1-hour, live and recorded video sessions every 3 weeks that you can join in over the internet or by phone.